How would your business be impacted if you could scale to meet niche market demands, provide innovative solutions, and outpace your competitors? If you want to find out, consider leveraging ISVs to help build your channel. In this blog, we explore the top five benefits partners receive when integrating ISVs into their channel strategy. Offer business-ready solutions – ISVs enable you to easily and effectively meet the needs of your customers today while future proofing value for tomorrow. Business-ready solutions deliver real value effectively, either all-in with cloud or a hybrid solution. Reduce time-to-value – Leveraging Microsoft investments in marketing, technology, training, and support enables ISVs to deliver solutions based on consistent platforms and tools which means you can grow your business faster. Increase profit potential – Working with ISVs can create and expand opportunities to grow existing business and profitability while empowering entry into greenfield accounts. In recent studies, IDC shows that 45% of infrastructure focused partners offer managed services. Of those that do not, 45% intend to do so in the next 12 months. Partnering with ISVs enhances competitive advantage and profitability through revenue capture in areas previously out of reach, and by lowering the overall investment costs for your customer. 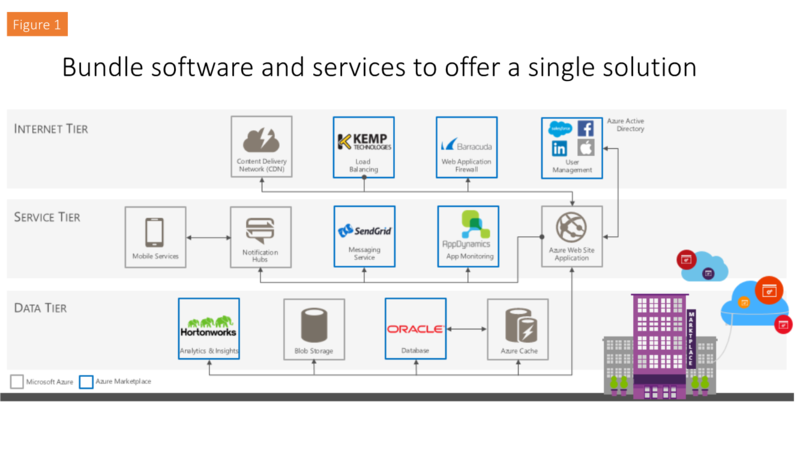 The chart below demonstrates how partners can enable end-to-end solutions, simplifying application development and facilitating the transaction of third-party services for customers with bundled software solutions. Successful partners attach services to their deals, such as consulting or training, and optimize their processes to secure more deals. A unified solution lowers infrastructure costs while maintaining top-line rates. 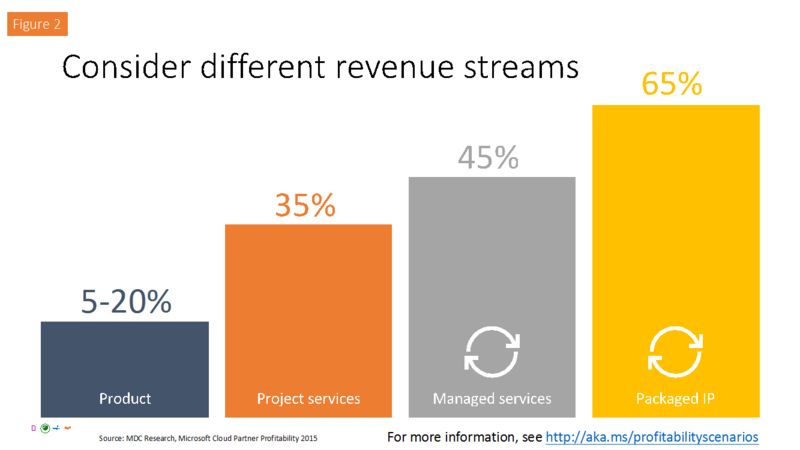 According to the data from our Partner Profitability study, it’s clear that not all revenue streams are equal. The solutions with Packaged IP drive the largest gross margins, which often exceed 65%. Utilizing the cloud and ISV packaged solutions opens up revenue with substantially lower the price of investment (e.g., no hardware or infrastructure costs). 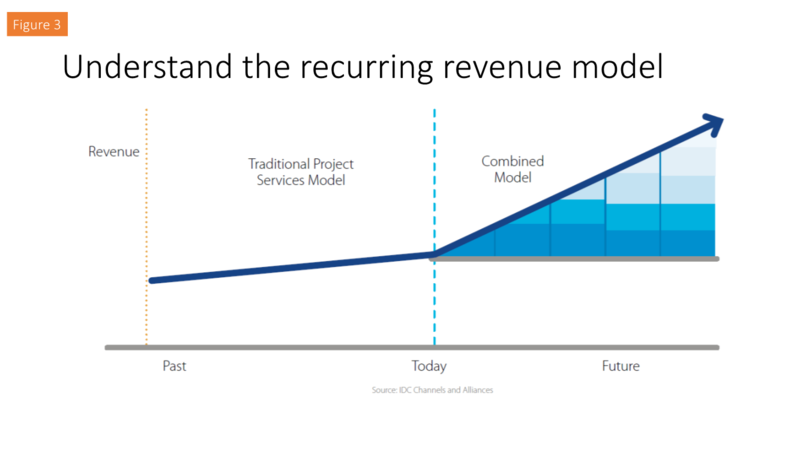 Two key insights from the Partner Profitability study were that nearly half of survey respondents already offer project services, managed services, and IP, and 50% of their revenue is generated by recurring revenue streams, including managed services and IP.The chart below further validates that recurring revenue is the new leading Key Performance Indicator (KPI) for most IT solution providers (a statement supported by the IDC). With many marketplaces emerging, it is important to differentiate yourself from the pack. Most competitor marketplaces do not have the level of support required to meet the ever-evolving customer demands. With the breadth and depth of the Microsoft ISV partner channel, your company is positioned to succeed. One approach is to build your services and solutions around industries of expertise. Create software packages that target your specialized market. You can leverage Microsoft’s industry-leading solutions, such as CRM Online, Azure, Office 365, and Power BI, and pair them with a unique industry-specific ISV solution to differentiate yourself from your competitors. Using ISV solutions to drive deep conversations with your customers can help you uncover additional needs and pain points. Become a trusted advisor to your customer by reviewing new and emerging ISV offerings, discussing scalability, customization requirements and integration needs, and build long-term relationships. Develop a programmatic approach to deploy and drive adoption, leverage ISV tools for repeatability in delivery, and offer a breadth of services to create more upsell opportunities. Developing and deploying IP that becomes a part of the daily life of a customer is one of the best ways to increase your value. Once you have a solution that offers these attributes, you can provide it to different customers to strengthen your relationships with them. Many customers are not ready to go “all-in” with the cloud. With Microsoft hybrid cloud platforms and ISV solutions, customers can easily keep some workloads on-premises while they migrate to the cloud. Target the innovators within the customer’s organization (e.g., the CMO) as their primary focus is the customer experience and brand perception. They are making more technology investment decisions than ever before and often have influence in other areas. By combining Microsoft offerings and innovative marketing technologies from ISVs, you can showcase yourself as the innovative and forward thinking partner they want to work with. How have you found value in partnering with ISVs? Share your thoughts and best practices in the comments below.